After 0.6 miles, this trail is currently closed due to damage from the creek. Leave your car in the parking lot near the Lodge. The trailhead for the Boulder Gorge Trail is located on the other side of the building. I like this challenging trail. It is difficult, steep, and runs along the stream. At 0.1 miles, hikers will come to Loree Chapel. At 0.21 miles, there is a wooden bridge. 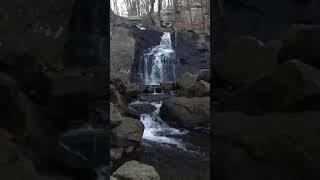 At 0.4 miles, there is a majestic waterfall. At 0.60 miles, the trail is closed. Beyond the sign, the trail is damaged, so you'll have to head back the way you came.